Rachael Kohn, of ABC Radio’s The Spirit of Things, is quoted on the cover as saying that The Shaman’s Quest is a perfect spiritual companion to Suzuki’s The Sacred Balance. There is indeed a connection but Suzuki is factual and practical as well as ethical. 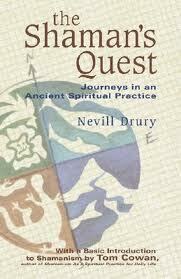 Drury has apparently written forty books on shamanism and visionary consciousness, some of which are thoughtful studies of New Age religion, but this one is pure wishful thinking. The irritating thing is that it doesn’t need to be: for goodness’ sake, how hard would it have been for him to have his Song of the Great Spirit tell the four shamans to return to their people and inspire them to start repairing the damage? This aspect of The Shaman’s Quest exemplifies the worst failing of New-Ageism, its retreat from reality. Religion as such is not the problem, however. A few minutes online will find literally millions of sites about religious approaches to caring for the world – Christian, Buddhist), Islamic (crosscurrents.org/islamecology and others), Baha’i (search), Taoism (search), Hinduism (search) and many more. That’s not to say that all religious people are conscious of their responsibility for the environment (wish they were! ), but that environmentalism is in complete accordance with the central teachings of all the major religions.